In October 1980, the Queen and the Duke of Edinburgh finished a state visit to Italy with a state visit to Vatican City to visit Pope John Paul II. 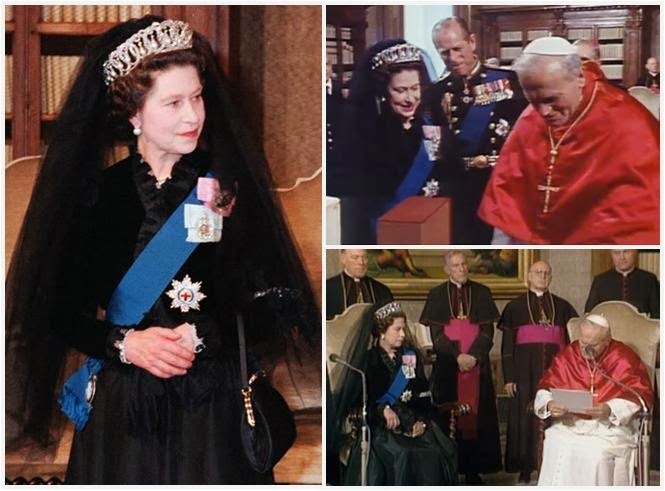 As mentioned when we covered their Vatican visit from 2000, going back in time marks a return to an extremely formal Vatican protocol, including a long dress in all black, with orders and a tiara to keep the veil/mantilla in place. The tiara of choice in 1980 was the Grand Duchess Vladimir Tiara, not the first time that tiara was used with a veil given its origin at the Russian court. She used the pearl drops on the tiara and accessorized the rest of her look with pearls and diamonds, including the Ladies of Devonshire Earrings, what looks to be a three strand pearl necklace, a pearl bracelet, and an evening watch. In addition to her family orders, she wore the Order of the Garter Star, Riband, and Lesser George - plus a rare sight, the actual Garter from the order, there on her arm. For a video from this trip and a glimpse at this supremely formal Queen, click here.